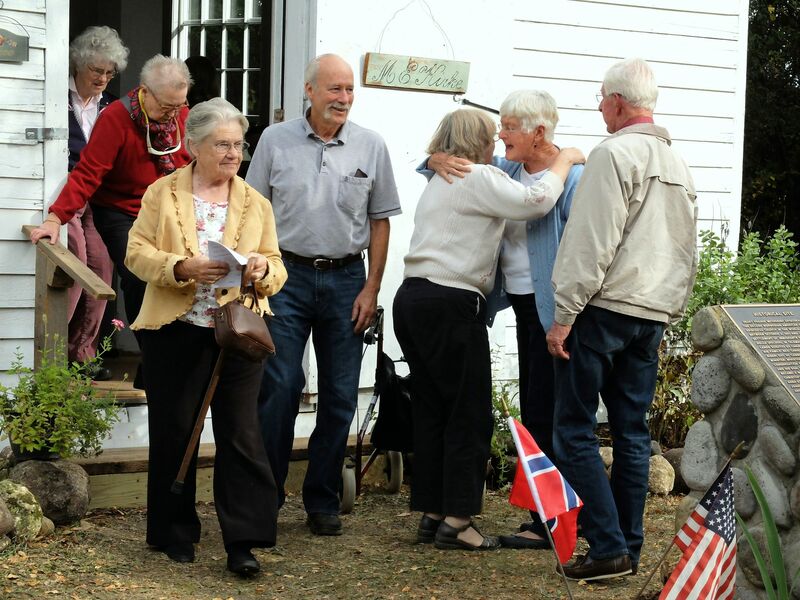 There are two upcoming events at the Norwegian American Methodist-Episcopal Church. Come see the newly restored church. 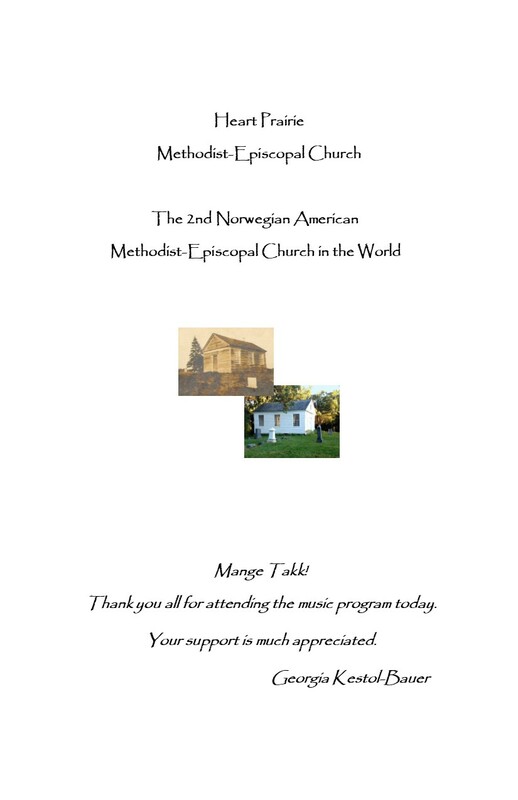 I want to thank everyone who attended the music program at the Heart Prairie Norwegian American Methodist-Episcopal Church on October 1st. 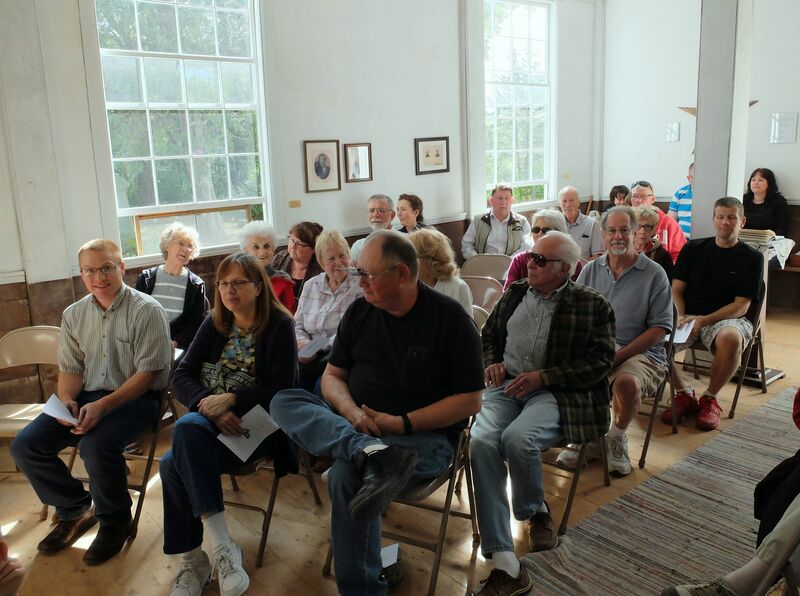 We had a large turn-out with more than sixty people in attendance. It was a standing room only event. Fortunately, it was a beautiful day, so even those who decided to listen while outside the church were comfortable on that warm sunny fall afternoon. 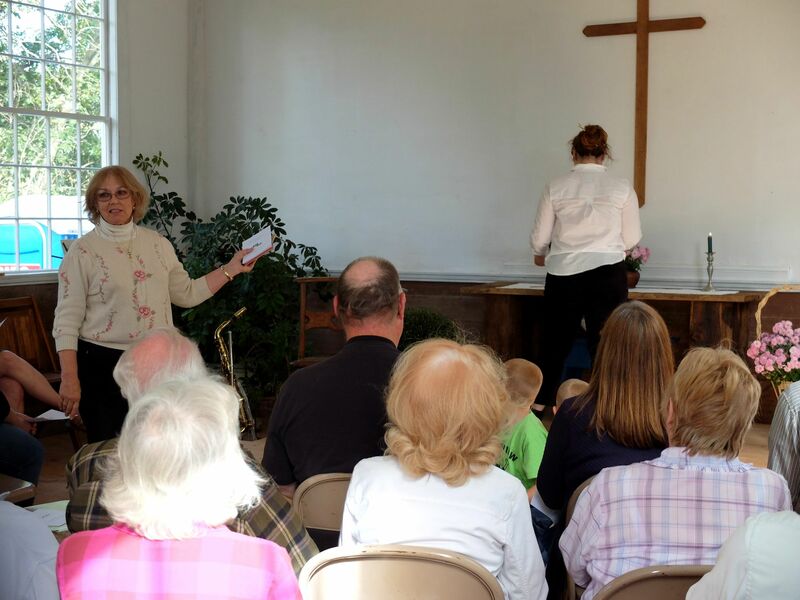 For those who were unable to attend, the two performing musicians were the Reverend Larry Froemming and Lisa Bauer, my daughter. Reverend Froemming, played our 19th century Estey pump organ which was donated by Duane Austin of Beloit. The organ is much like the one used originally in the church. 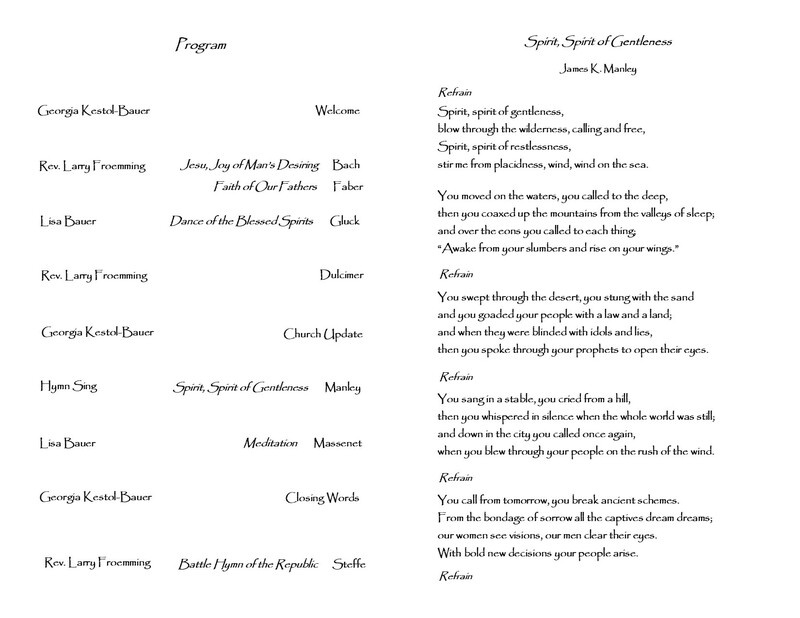 The program began with the ringing of the church bell by Jonathan Kestol and Fox Bauer. Rev. Froemming began the music program with Jesu, Joy of Man’s Desiring by Bach and Faith of Our Fathers by Faber. Then Lisa, playing solo flute, followed with Dance of the Blessed Spirits by Gluck. 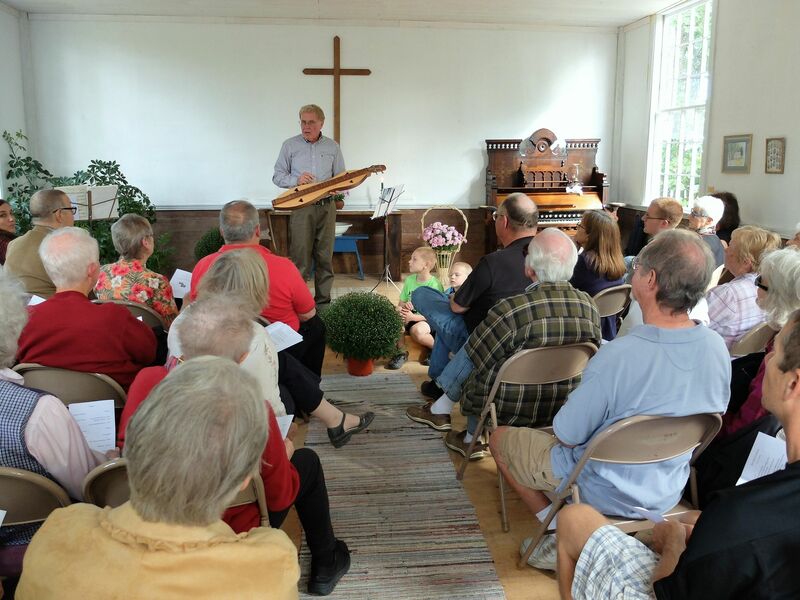 Reverend Froemming finished the first part of the music program with several numbers on the dulcimer. He explained that in the 19th century many church congregations lacked the money to purchase an organ, so they sometimes chose to purchase a dulcimer which cost much less but still provided instrumentation for the church music. The video below features Reverend Froemming playing the dulcimer. Although it was not listed on the program, I next asked my daughter, Lisa Bauer, to play a quick tune on the saxophone that belonged to Joseph Kestol, my uncle, who was the custodian of the cemetery for over fifty years. Joey Kestol was a farmer by profession, but he was also a good musician. He played saxophone in a number of bands in the area for many years, and he was a long time member of the Whitewater City Band. Here is a short video. I next reported on the progress of the church restoration over the past year. The windows are now finished and special recognition goes to the families who donated the windows. They are the McIntyres, the Johnsons, the Browns, and the Fischers. One window, dedicated to the Steensons, was funded by community donations. The one original window is dedicated to the Kestols. Special thanks also go to Whitewater Glass Company for providing the glass for the window project. The church now has several smaller items that should be mentioned. These include a prayer chair beautifully rebuilt and refinished by Jerry Kramer of Whitewater, a star built from the original church floorboards by Jim Holden of Elkhorn, rag rugs donated by Larry and Terri Yanke, a 19th century table/bench made by the grandfather of Flora Helling, and a new altar made from original boards of the church. I also want to thank Evie McIntyre for all the landscaping she has done in front of the church, around the bell, and on the south side of the church. Tony and Janet Brown also deserve enormous thanks for clearing out the brush from behind the church. The plan is to make a wide path behind the church and cemetery so one can walk from one end of the cemetery to the other. The following video includes most of my remarks for the church update. 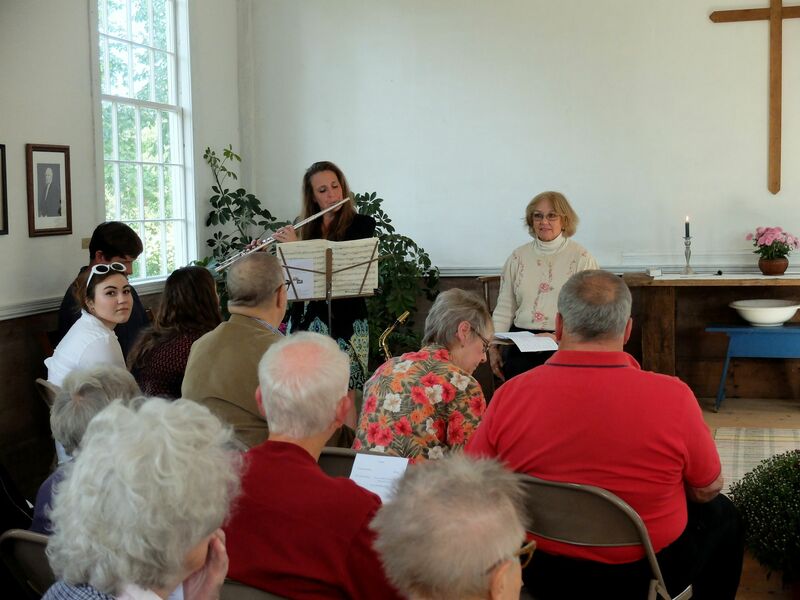 After the church update, the music program continued with everyone singing the hymn, Spirit, Spirit of Gentleness accompanied by Reverend Froemming on the organ. That was followed by a solo presentation of Lisa Bauer playing Massenet’s Meditation. After a few closing remarks from me, the music program then concluded with Reverend Froemming’s wonderful performance of the Battle Hymn of the Republic. 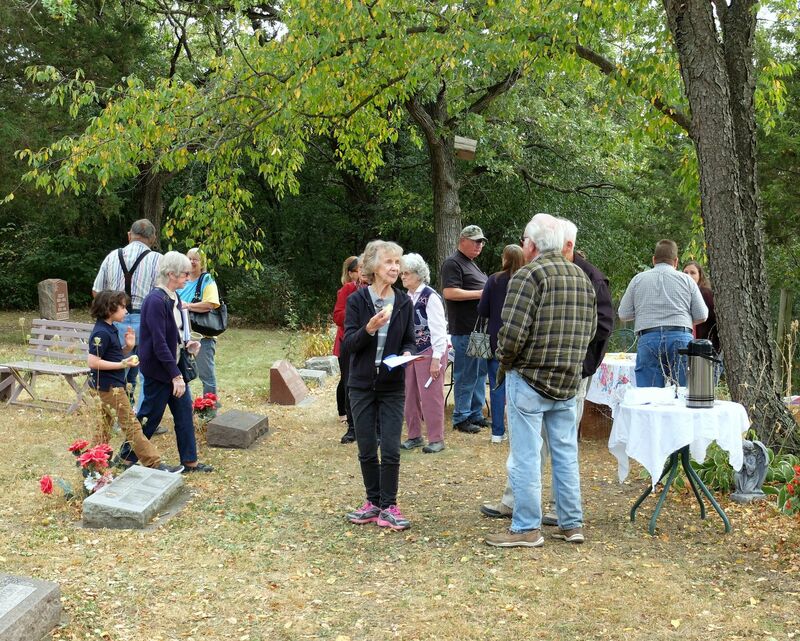 Lisa Bauer continued to play outside as refreshments were served as people mingled. 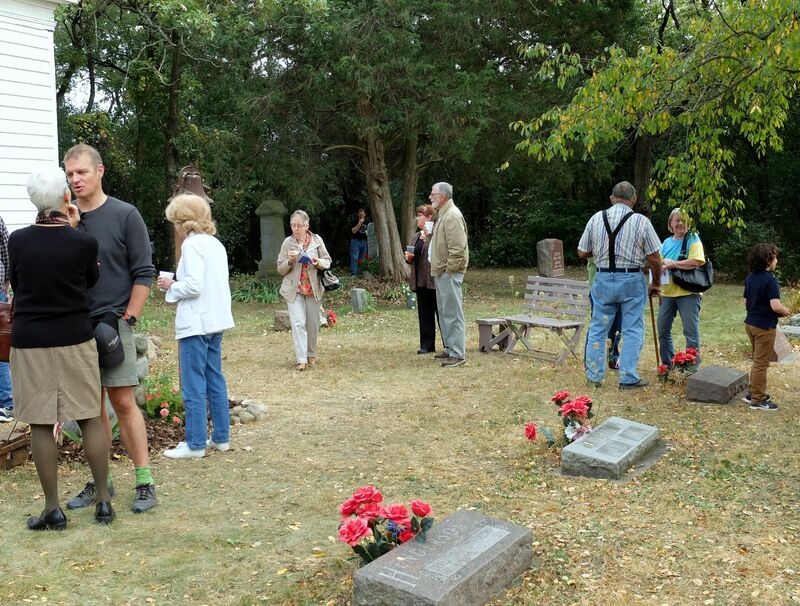 Several people took the self-guided tour of the cemetery. 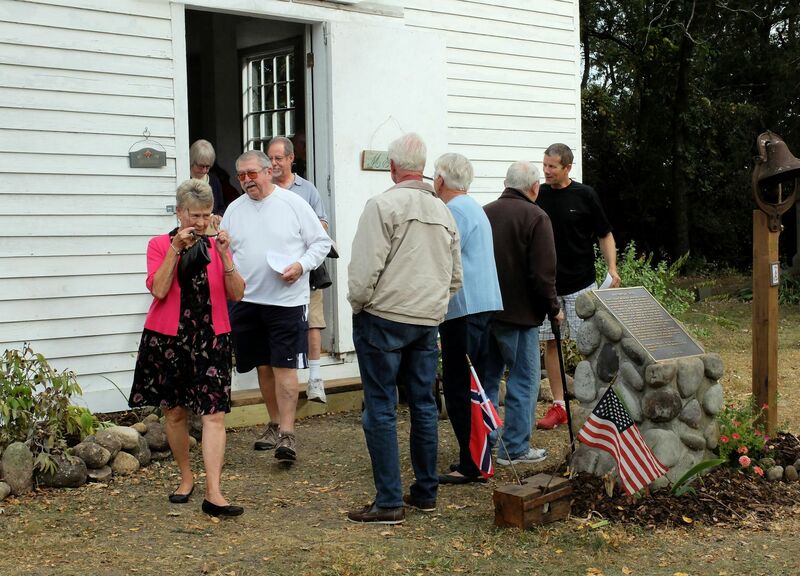 Refreshments included coffee, apple cider, fresh apples, and Norwegian cookies such as krumkake and sandbakkels. I want to give special thanks to Quednow’s Heirloom Apple Orchard for providing the apple cider for the event. There were numerous comments about how good it was. Again, I want to thank all those who made this event possible, especially the musicians Lisa Bauer and Reverend Larry Froemming. Thanks go to Charles Cottle who printed the flyers and the programs. He also maintains the website. 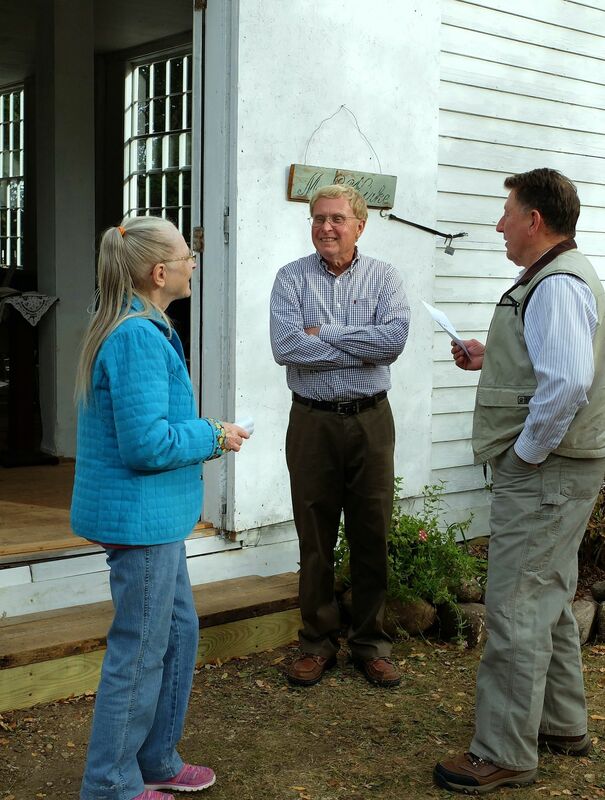 I am especially appreciative of everyone who has given donations to the church restoration. 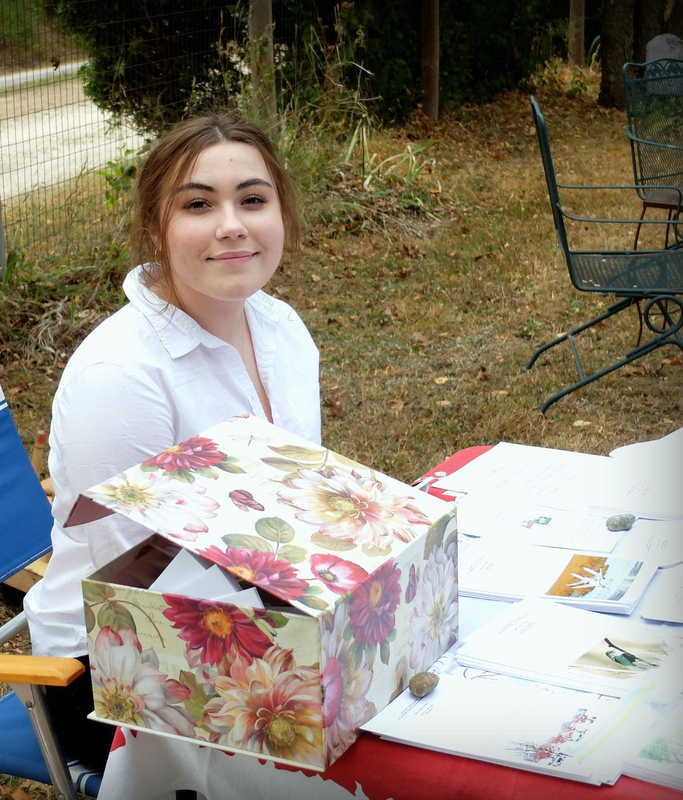 At this year’s program, you were kind enough to donate more than $1,200.00. That amount will be extremely helpful in the coming year as we plan to complete the interior painting in the church, build a railing for the altar, and build pews like those that existed originally. I hope you all can come next year to see the progress on these projects. 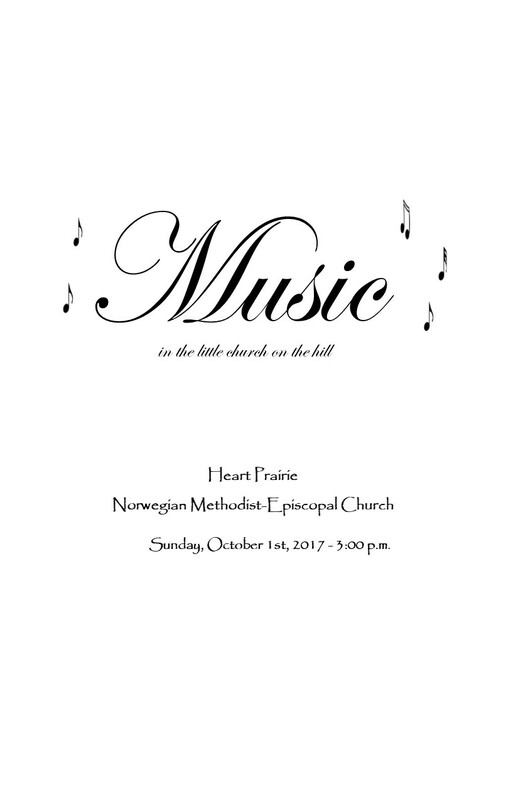 I am pleased to announce that we will have a music program on October 1st, 2017 at the Heart Prairie Norwegian Methodist-Episcopal Church. Rev. Larry Froemming has agreed to play our Estey pump organ and the dulcimer. Also on the program will be Lisa Bauer playing flute. I encourage everyone to come out to the church to enjoy the program and to see the progress of the restoration of the church. The church is located at the East Richmond Cemetery. If you are unfamiliar with the area, here is a map to the church. Below is the flyer with all the details. I hope to see you there. As spring approaches, I want to update you on the status of projects at the Heart Prairie Norwegian Methodist-Episcopal Church. Windows: The new windows, made identical to the original windows by Dan Medema of Delavan, were installed about a week before our fall event. They look beautiful. There is one original window which we were able to use. And in this window, two of the small panes of glass are original. All of the new glass used in the windows, 142 10×12 inch panes, was donated by Whitewater Glass Co. 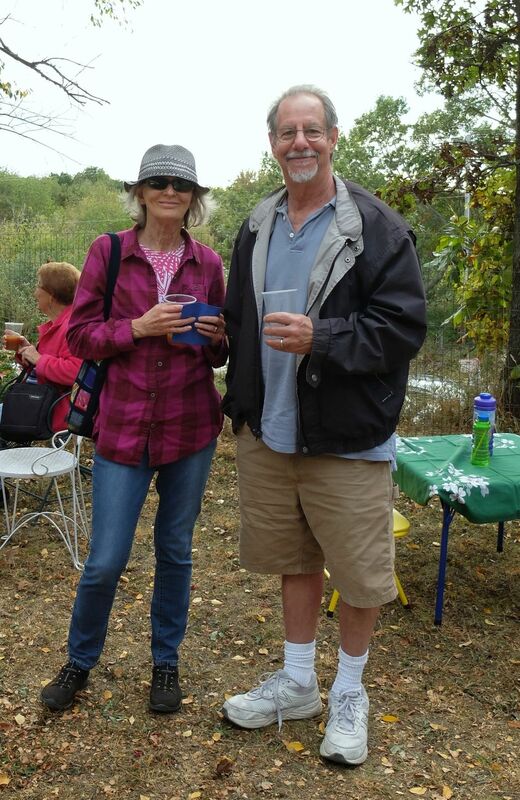 Thank you, Tom and Rene Foelker – owners, for your support. Organ: A beautiful fully restored Estey Pump Organ was donated to the church by Duane Austin of Beloit. Rev. Larry Froemming of Beloit brought the organ to the church. An accomplished musician, Larry proceeded to play many hymns on the organ. The sound was fantastic! It is wonderful to have a working pump organ again in the church after possibly close to 100 years. Listen to the organ’s great sound as Rev. Larry Froemming plays the Battle Hymn of the Republic. Prayer Chair: Jerry Kramer of Whitewater, who is skilled in refinishing furniture, saw our Prayer Chair at the fall event and noticed it was in need of repair He took the chair home and refinished the wood and replaced the seat without any charge to us. Thank you, Jerry. We now have a beautiful, usable Prayer Chair. Interior primer: The ceiling and walls have been primed. The ceiling boards are new, but the walls are the original plaster. The walls had never been painted because they had always been wallpapered. The walls will be papered again before we have the pews made, but for now the walls look nice and clean with the white primer paint. Exterior siding: The Brown family donated a large amount of cedar siding for the repair of the exterior. There is enough siding to complete all the exterior work and what is left will be stored for future use for the church. Thank you very much Bonnie Brown and Tony and Janet Brown. Work on replacing the broken siding was started in October and continued into November. Ramp: A ramp for disabled was donated by Elizabeth Hjortland. It is the perfect size and we are so happy to have the ramp. Thank you, Elizabeth. Elizabeth is a descendant of Peter Kestol, a founding member of the church. Exterior primer: In October and November, the whole back of the church (east side) was repaired and painted. Most of the south side of the church has been repaired and painted. Hopefully, we will be able to apply the finishing coats of paint this year. Dear followers of this site, we have scheduled a Fall Social and photo exhibit for Sunday afternoon, October 9, 2016. Wildlife photographs (mostly birds) by Charles Cottle, retired UW-Whitewater professor, will be featured. Refreshments will include apple cider and Norwegian bakery. 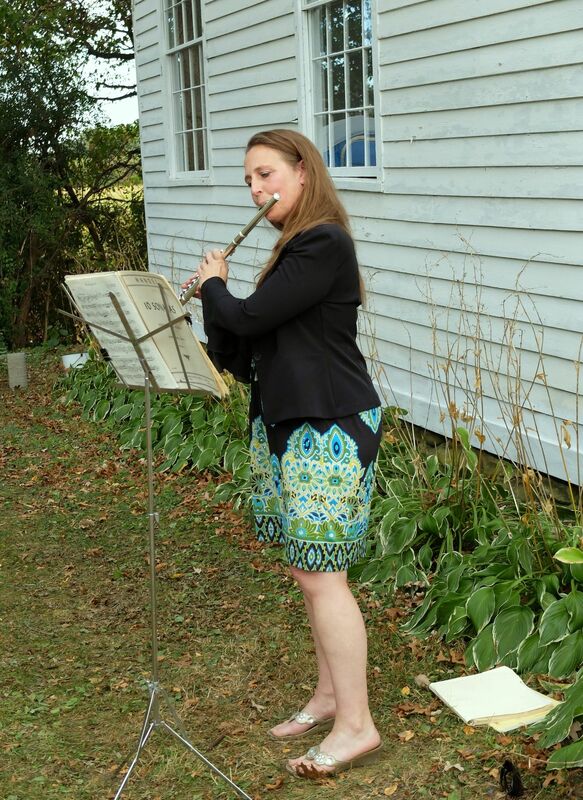 Lisa Bauer will play the flute, and as before, there is a self-guided tour of the the cemetery available. Here is the announcement. Please share it with all who might be interested. We hope to see you there. As noted, framed and unframed photos will be available for sale. We will also have note cards available. Charles says he will gladly take orders for photo sizes not available at the event. For those who may not know how to get to the East Richmond Cemetery on County Highway P, here are the maps. 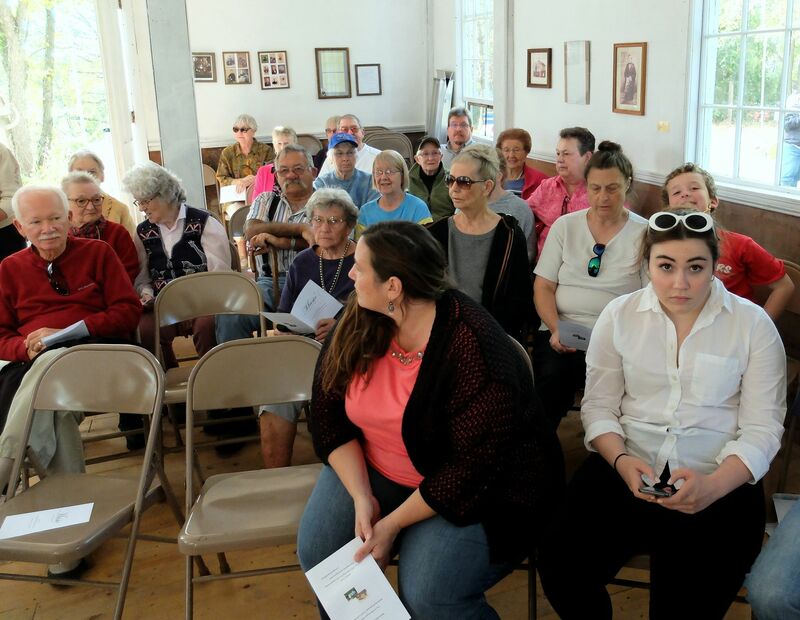 It has been a while since news has been posted here, but that does not mean the restoration of the Heart Prairie Methodist-Episcopal Church has stalled. In fact, much has happened over the summer. Much of the activity this summer has focused on the construction and installation of new windows for the church and the painting of the walls as shown in the photos below. Because everything in the church is being restored to its original condition and appearance in the 1850’s, the window restoration was painstaking and tedious. Fortunately, volunteers helped the project along. The follow photo is of Evie McIntyre painting a church window dedicated to the memory of her parents. In the photo below, Rhonda Thompson, the great-great-great granddaughter of Christopher Steenson is painting one of the new windows. Christopher Steenson was one of the original founders of the church. It was he who gave the land to the community for the cemetery. Below is a photo of Alexandra Kestol, great-great-great granddaughter of Peter Kestol, one of the church founders, painting trim at church. And here is a snapshot taken sometime in the middle of getting the walls ready for priming. As shown, the cracks in the plaster have just been repaired. Another major event in the church restoration this summer was the acquisition of a new organ for the church. Donated by Duane Austin from Beloit, Wisconsin, the organ was delivered on Tuesday, September 27th, by the Reverend Larry Froemming. The organ is in great shape and sounds wonderful. Look for a video in this space soon. 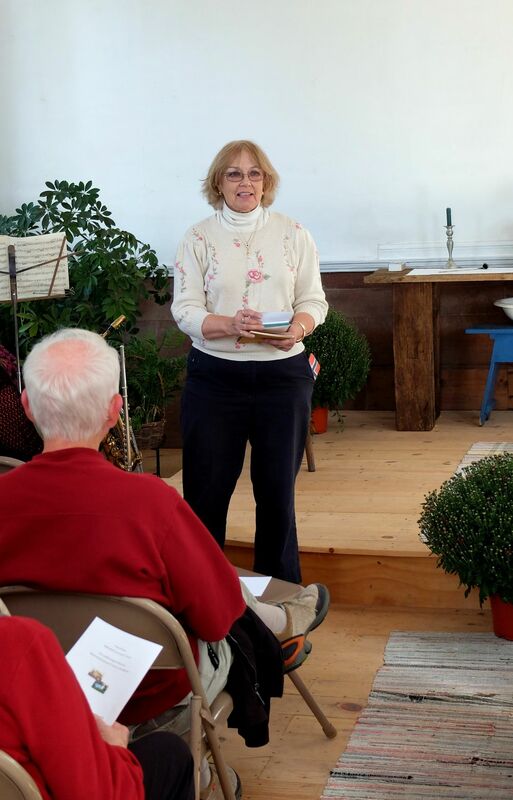 During the past year, the descendants of the early church founders got together for the first time. In May, Georgia Kestol-Bauer traveled to Eau Claire, Wisconsin to meet with the Stensen family. And later in the summer, Rhonda Thompson and her husband, visited the church. While there, they painted one of the windows. In the photo below, Georgia Kestol-Bauer visits in Eau Claire with Iner Stensen Jr., the great-great grandson of Christopher Steenson. Georgia Kestol-Bauer Visits with Iner Stensen Jr. The photo below pictures Georgia Kestol-Bauer with the Stensen’s in Eau Claire. 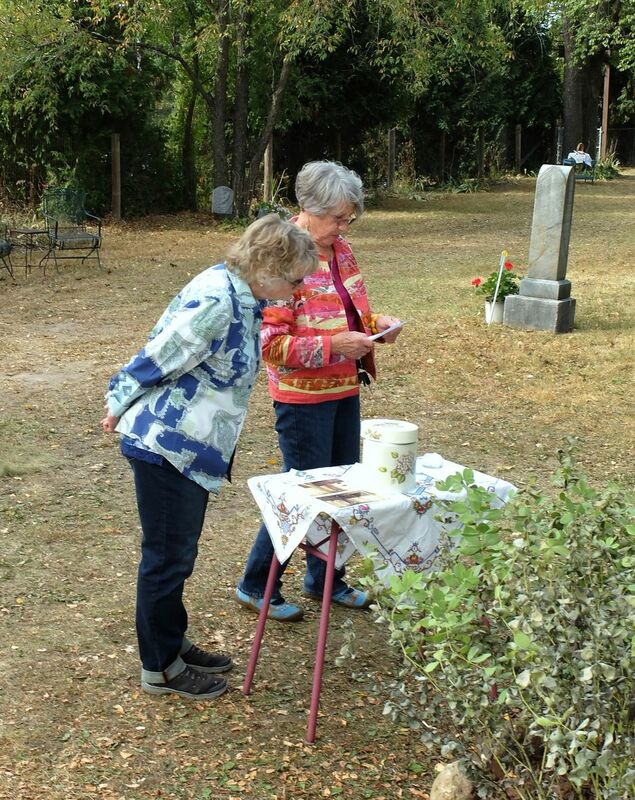 Thank you to everyone who attended the Open House at the historic Methodist-Episcopal Church at the East Richmond Cemetery on August 24, 2014. Attendance was nearly 100 on a hot and humid afternoon. Many of you made monetary donations and I thank you very much for your generosity. The donations totaled over $500 and will be used to begin the restoration of the windows. Near the completion of this project, we want to have another Open House to celebrate the restoration of this historic church. Until then, with your support and encouragement, we will keep working! A few snapshots of the Open House are shown below. 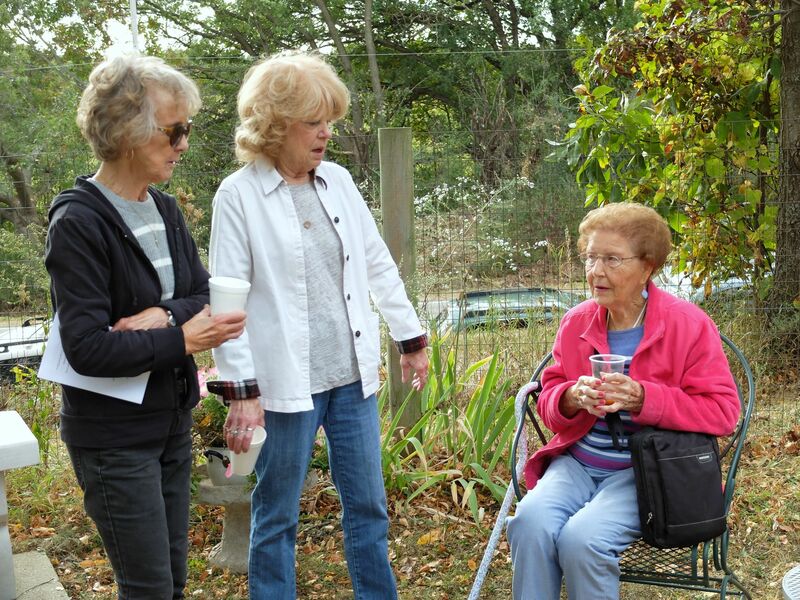 Arlene, pictured on right, discusses the restoration with guests. Original church books are displayed on the table. Lisa, daughter of Georgia Kestol-Bauer, played the flute for the Open House.